Choosing the right position as a newly graduated occupational therapist is a hard decision. You want to start making money, paying down those student loans, but most of all, apply what you learned and helping clients. 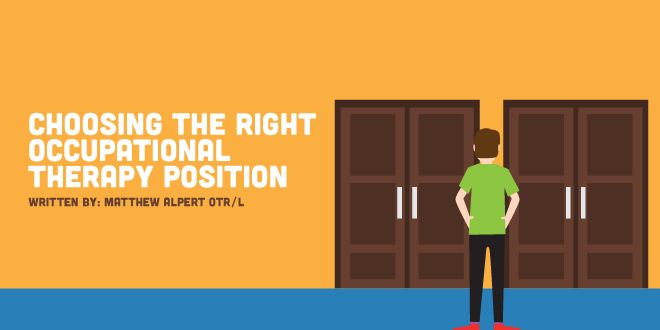 The difficult part about choosing a position will be first choosing the area of practice you want to work in. Whether it is the pediatric or geriatric population, the following considerations will be generalized and will allow you as the new grad to make the best decision possible. Per-diem vs Staff Therapist Positions? A per-diem position will typically be defined as a temporary, as needed, or fill-in therapist. Per-diem positions do NOT offer benefits compared to a staff therapist position. A per-diem position will generally pay significantly more than a staff therapist position simply because there are no benefits offered. The higher hourly rate of a per-diem therapist is intended to supplement the cost of health, disability, insurance and other benefits that are offered to the staff therapist. As New Grads, you will come across per-diem positions more frequently than a staff position. On the other hand, the much-desired staff positions are what all new grads are fighting for! A lot of the time these positions will be requiring a certain amount of experience. The reason staff position is harder to come by is because it offers benefits and sometimes additional perks such as personal shopping, organizational discounts, and employee incentives. The benefits of a position will always differ between organizations. Each facility will have their own benefits package. You can inquire about the specifics from your potential employer. Sometimes these little details make a big difference when it comes down to selecting a position. Does the Position Offer a Mentoring Program? I personally chose my current occupational therapy position simply based on two factors. The first being the type of setting. Secondly, the mentorship I was offered. I want to he a Certified Hand Therapist (CHT), so I chose to work for a very experienced CHT as the only other occupational therapist there. Finding an opportunity like this is rare and I had to take it. Asking around about annual salary or hourly rate is a little bit taboo. Most people feel uncomfortable when it comes to asking their co-worker about these topics. It's good to know if you being offered a good salary or not. Always remember that you need to start out somewhere. Additionally, annual salaries for occupational therapists are highly dependable based on geographical location and the population being treated. You want to look at what the averages salaries and hourly rates for you local area are. These rates can even vary between counties. You want to look at what the averages salaries and hourly rates for you local area are. These rates can even vary between counties. With all things considered, it's its time for you to pick your ideal position as an occupational therapist!